US, 1984, 91 minutes, Colour. Tom Cruise, Craig T. Nelson, Leah Thompson, Charles Cioffi. All The Right moves is a football film. It is effectively set in a Pennsylvania mining and industry town. The life of the town, the mines and industry, the closures and unemployment are important background. Characters feel trapped. The film focuses on Stef, played with some enthusiasm by Tom Cruise. It was an early Tom Cruise film. He is a star football player but clashes with the coach (played by Craig T. Nelson who was to go on to the televisions series, Coach). Others in the cast include a young Leah Thompson as Stephan's girlfriend as well as Christopher Penn. 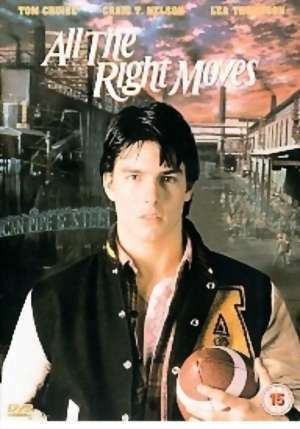 The film is predictable in its plot - it has many of the cliches of the young man trapped in the town, relationship with his girlfriend, friends and unwanted pregnancy, clashes with the coach, the defeat of the football team, the possibilities of Scholarship for football and an-education to get out of the town. However, while the treatment is quite predictable, there is an earnestness about the film which raises the questions for, especially, a younger audience. Director is photographer Michael Chapman (Strangers Kiss). 1. A piece of Americana? Life in the American town of the 1980s? Employment and unemployment and chances? Education? sport? 2. The importance of the location photography? The authentic atmosphere of the town; Houses, schools, sports stadiums, the mines, industry? The musical score? Songs? The editing and pace for the football sequences? 3. The title and the reference to football, to Stephan's life? Ironies? 4. Tom Cruise as Stef: ordinary young man, ending high school, ambitions, his room, drawings, hopes to be an engineer, breaking away from the mines and the factories and the lives of his father and brother? His relationship with Lisa, tenderness, the sequence in the car and her halting him, his reaction, his rudeness towards her, the tensions? His love for her, the dance, the reconciliation and apology, his humiliating her in front of the bus? The night together and the bond between them? His staying in the town - and her wanting him to go? His friendships at school, especially with Brian? Brian's plight and Tracey's pregnancy and his advice? His skill at football? Relationship with the coach, the training sequences? The important match? The defeat, the coach's attack on the player, Stef's reaction against the coach, telling him off, his being dismissed? The humiliation? The rubbishing of the coach's house and his being present? Pleading with coach, the apology to the coach's wife? His anger, resignation to staying, the support of his father and brother? Working in the factory? The offer of the chance to leave, his thanking the coach? Leaving the town - his future? to marry, the marriage sequence - his enjoyment of the wedding, his bewilderment, supporting Stef? 6. The portrait of Lisa, her place in the town, family background, her future? Her interest in music, wanting to study? The scholarship for the sports students? Her resisting Stephan, with him as the dance, the bedroom sequence? Her Love for him? Going to the coach's wife, pleading his cause? Able to let him go? The story of the coach's wife and her teenage love? 7. The portrait of the family, the absent mother, the hardworking father, the unemployed brother and his reaction, drinking? Their support of Stef? 8. The coach, the image of the coach and his training, hard? The rousing of the players to win the game? His disappointment? Abuse of the student? The referring to the players as ladies etc? His sacking of Stef? His doubts, relationship with his wife? His stubbornness against Stef? The rubbishing of his house and his angry reaction? His not forgiving Stef? The encounter in the street, Stef and some truths? His reaction, his transfer? Just being a high school coach - going to college? The offer to Stef the apology? The future? His wife and child? 9. The picture of the players, their camaraderie, the jokes in the locker room? The practices? The fights? The match, the losing? Blaming of the player? His being arrested for armed robbery? 10. The players at the pool table, tough, supporting the football team? Driving and rubbishing the coach's house? Taking Stef with them? Stephen's plea that they tell the truth - and Bosco not being willing to tell the truth? 11. A piece of Americana, a youth film, the exploration of serious questions - how predictable, how insightful?